Pooja Hegde Leaves Herself In Split! It is hard to perform a split and then sustain it. As the body will be experiencing great elongation of thigh muscles. The stretching exercises doesn't make you too flexible to perform such stunts enthusiastically but some pull them off with ease. Pooja Hegde, without showing any pain, she could perform the split and better she could hold it as long as the camera could capture her. She even laughed out loud for the snap and gave different expressions. She is also a fitness freak like Rakul but seems to be maintaining her face glow better than the former. What can we say, she did not just win over producers for big films, she won over us too. Soon, we will see her on-screen in Maharshi with Mahesh Babu on 9th May. 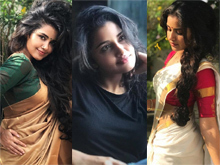 Majili Girl Manages To Reveal Nothing!